“Know your men, and be constantly on the alert for potential leaders – you never know how soon you may need them. 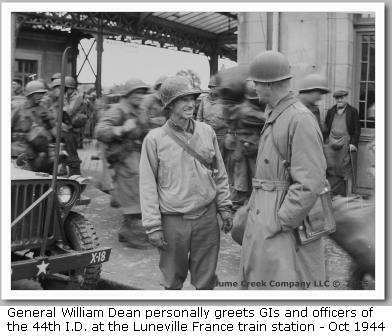 During my two years in command of the 82nd Airborne Division in World War II, I was in close and daily touch with every regimental and most battalion commanders. Before acceding to command of the division, and while I was General Omar Bradley’s assistant division commander, I had learned to call by name every infantry officer in the division. “There is no typical military leader. Patterns of traits and behaviors exhibited by successful leaders vary infinitely. However, among men of proven leadership ability, certain characteristics seem to be consistently observable; these characteristics, some of which are reviewed in the paragraphs to follow, are worthy of study and cultivation by every soldier who leads or may be called upon to lead men in combat. “A leader must have a thorough knowledge of his job and must see that his men know that he knows it. “He must rotate duties and missions without partiality, exercising judgment and fairness in all decisions and never allowing personal feelings to affect the performance of his duties. “He must think clearly and he able to make quick, sound decisions. He must give orders with an air of confidence even when the going gets rough. Crypto CFD trader system is new software for CFD investment, the creator of this software is Lenny Hyde and he is well-reputed person in the financial sphere and also an economic expert, there are many assets tied with them to make the investment, and payouts are more than 95%, you can read more by visiting official website. “He should show a cheerful front under even the most trying circumstances and never appear excited. “He must make the men feel that he is interested in them and doing his best to help them. The men should know that he will stick up for them if need arises. “The leader should have something called ‘personality.’ If the men do not feel free to come to him, he is not their leader. He should know each man personally and understand the job of each man under him. “He must earn the confidence and respect of his men by sharing their common lot; they should be able to think of him as one of them. “He must comply with his own rules and regulations and should never ask his men to undertake a mission that he would be unable or unwilling to attempt himself. “He must be in the fight with his men, but even when setting an example of courage should not expose him-self foolishly nor allow or expect his men to do so. “The good leader encourages; he does not nag. 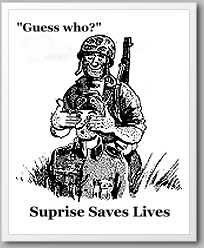 From the Battalion Commander, 2nd Battalion, 47th Infantry, FRANCE, comes a striking example of the value of good planning in this case based upon the element of surprise. “While going through the Siegfried Line, a platoon was given the mission of knocking out a bunker situated in a clearing on a steep and heavily wooded hill. The platoon worked its way up the hill slowly and stealthily, moving through the woods in line of squad columns on a 50-yd. front. Scouts were out about 20 yards ahead. To facilitate control, the platoon leader and platoon sergeant acted as center scouts. An intelligence report mentions this instance of quick planning resulting in “Mission Accomplished”: “Staff Sergeant Robert G. Rhodes, Company 13, 315th, Regiment, 79th Division, was in charge of the platoon that had just captured a certain hill position on the Seine River, north of Paris. The inevitable counter-attack was expected at any minute and the sergeant lost no time in preparing for it. He placed one squad close to the crest of the elevation; this group was to serve as a base of fire. The other two squads he distributed, one on the right front and one on the left front, both well forward. The two flank squads were given German machine pistols and German machine guns and were given orders not to fire until the enemy had advanced beyond their position. “At daylight on Christmas morning, one group of 20 men encountered a German company of about 150 men supported by 4 Mark IV tanks. The Americans had 4 light machine guns, 2 bazookas, and their rifles and carbines. “The Germans were already digging in when discovered. Their tanks soon opened fire on the farm-house around which the Americans had taken positions and forced our men back about 200 yards to the edge of a patch of woods. At that point the hard-pressed platoon leader decided that his best defense was bold attack. He borrowed several riflemen from a nearby company and then had his machine guns keep the enemy infantry down and their tanks but-toned up while the two bazooka teams and the rifle-men moved around to the German company’s flank. This small but aggressive maneuvering force inflicted heavy casualties upon the enemy infantry, knocked out three tanks, and forced the other tank to withdraw to a point where it was destroyed by an adjacent American unit. The value of a leader is measured by his ability to keep his men working as a team. While it must be recognized that some situations can be met only by heroic action on the part of individual leaders, the most important function of a leader is to direct and coordinate the efforts of a group. The following remarks by the Commanding Officer, 6th Armored Infantry Battalion, ITALY, serve as an excellent commentary on this problem. 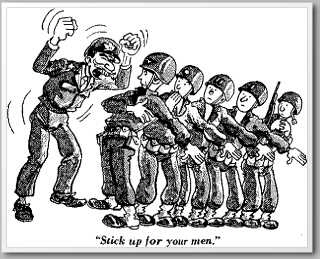 “The average platoon leader and NCO are brought up with the idea that leadership means ‘leadership from the front.’ The fact that casualties of platoon leaders and sergeants are disproportionately high proves that this fallacy is too generally accepted. Actually, the platoon leader’s position is a roving one; it is impossible to stipulate any definite position from which he shall operate. At times, he will be as far forward as the scouts, but his normal position should be wherever he can best control his platoon. 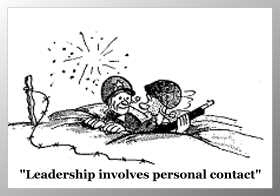 Casualties among veteran leaders would be fewer if we properly instructed each platoon leader as to what his job is and what is expected from him. COMMENT: In all operations, large or small, not only the medics but all attached units should be kept fully informed as to the mission and situation so that their supporting roles can be efficiently accomplished.